We are living in an era of increasing recognition that the New Testament Scriptures teach the equality of men and women in the New Covenant, with qualified servant leadership based on gifting and not gender. It is often argued by some Christian men that the equality of Christian women violates the tradition of the church. "If New Testament actually taught equality we would see women as church and religious leaders in centuries past." Yes we would; and we do. Christian history is filled with gifted women advancing the kingdom through preaching, evangelizing, teaching, and leading others spiritually. I'd like to acquaint you with one such women from the 1700's. Her name is Selina Shirley, but she is most often referred to as The Countess of Huntington. Her husband, the Earl of Huntington, held the same title that the legendary Robin Hood possessed (e.g. the Earle of Huntington) centuries earlier. Selina's husband was influential and rich, but it was she who would make an immeasurable impact on the advancement of evangelical Christianity in both England and America. Selina Shirley was born August 24, 1707 in Chartley, England. Baptized as an infant into the Anglican Church, Selina lived the privileged life while growing up in English high society. At age twenty-one, she married the Earl of Huntington. Selina named among her friends King George II, Sarah Churchill the Duchess of Marlborough, and Lady Mary Wortley Montague. If there were a movie made of her life today it would be a cross between Pride and Prejudice and Downton Abbey. "The doctrines of these preachers are most repulsive and strongly tinctured with impertinence and disrespect towards their superiors, in perpetually endeavoring to level all ranks and do away with all distinctions. It is monstrous to be told that you have a heart as sinful as the common wretches that crawl upon the earth. This is highly offensive and insulting, and I cannot but wonder that your ladyship should relish any sentiments so much at variance with high rank and good breeding." "For the past two weeks I have given instruction and some short exhortations to the weak, and have found them to be of great use, especially among my work people, with whom I spend a part of ever day." One of those who eventually fell under the influence of Selena's gospel ministry was her husband, the Earl of Huntington. He, too, came to faith in Christ shortly before suffering a fatal stroke at his Downing mansion on October 13, 1746. Selina was now a wealthy widow at the tender age of thrity-nine. "We agree that the one thing worth living for must be proclaiming the love of God to man in Christ Jesus. As for me, I want no holiness he does not give me; I can wish for no liberty but what he likes for me, and I am satisfied with every misery He does not redeem from me, that in all things I may fee, 'without Him, I can do nothing.'" Meanwhile, Charles and John Wesley split with George Whitfield over a disagreement of soteriology. The Wesley's did not hold to "imputed righteousness" as did Whitefield, with Charles Wesley even calling the doctrine "imputed nonsense." The Wesleys much preferred to trust in methodical disciplines in the Christian life (thus, "methodism") instead of the righteousness of Jesus Christ for our right standing with God. Whitefield found the acrimony with the Wesleys disheartening. Soon it hit his pocket book as most of the Methodists in England became ardent followers of the Wesleys (e.g. Wesleyans). Whitefield found supporters for his orphanage and preaching crusades diminishing. In stepped Countess Huntington. She loved the doctrine of imputed righteousness and understood it to be the very gospel itself. She opened her majestic mansion in Park Street (London) for Whitefield to preach, and she named him the "chaplain." The difference between a "chaplain" and a parish priest is that a "chaplain" was a privately funded pastor rather than state funded. Even though privately funded, the Prime Minister of England, members of parliament, and others began coming to the Countess' house for religious conversation. Many men and women in London -- initially beyond the reach and sphere of Whitefield's influence --came to faith in Christ through the influence and friendship with Countess Huntingdon. Philip Doddridge would later write of the spiritual awakening in London during the 1750's and say, "Religion was never so much the subject of conversation." The Spirit was the direct Agent of the"Great Awakening" in England, but one of the means He used was the Countess of Huntington. 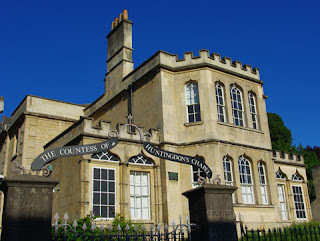 The Countess was responsible for founding 64 chapels and contributed to the funding of many others, Lady Huntingdon and her chaplains were initially members of the Church of England, but in 1779 the Church of England prohibited her chaplains from preaching in the Pantheon, in Spa Fields, Clerkenwell, a building which had already been rented by the Countess. To avoid the authoritarian top-down control of the Church of England, the Countess took shelter under the Toleration Act and became one of England's "official" dissenters. "Lady Huntington devoted herself, her means, her time, her thoughts to the cause of Christ. She did not spend her money on herself; she did not allow homage paid to her rank to remain with herself. You will see a few places in the United States that are tributes to Countess Huntington, including Huntingdon College, in Montgomery, Alabama, a co-education liberal arts college named after her, and Huntingdon Street in Savannah, Georgia, named in recognition of her association with Whitefield and John and Charles Wesley in their missionary work in the Colony of Georgia. For you young ladies who feel the call of God to minister in the Kingdom of Christ to people in need of a Savior, I would encourage you to become familiar with the biography of the Countess of Huntingdon. She's a model worthy of imitation. I've been reading this series with interest, but one thing I haven't found clear from your statements, are you saying all positions of leadership are open to women or that women should have positions of leadership? If you are saying all positions of leadership are open to women, what do you do with the Titus passage on Elder qualifications? "I sometimes wonder if modern conservative evangelicals are swimming upstream in their attempts to restrict gifted women from Kingdom work, both through a misunderstanding and misapplication of the New Covenant Scriptures as well as a very poor comprehension and understanding of our evangelical past as it relates to women." Doesn't this seem a bit lofty and condescending? Given all of the Scripture passages that seem to be relative to the roles of men and women I find it impossible that anyone could reach a conclusion that allows them to be so rigid and confident. Anyone with an antithetical position could say the same thing about those who reach your conclusion. The style and traditions of today's contemporary church have, and are, changing dramatically in terms of music, local church structure, mission obligations and incorporation of the technological advances in means of communication and broadcasting. The views and perspectives of the church, including the conservative evangelicals, have altered in so many ways. Yet the concept of women filling the roles of senior pastor (and I believe that is the most basic question here) continues to be held and implemented by very few. Why? I personally believe it is more complex than simply attributing it to a "misunderstanding and misapplication of the New Covenant Scriptures" by those who continue to choose to have men in those roles. Could it be more than a matter of we "conservative evangelicals" being ignorant and uninformed of Biblical content and intent? Could it have anything to do with God's intended order for leadership in the family and in the Body of Christ? Is there any possibility of there being an element of divine Providence involved? These are questions which restrict me from voicing that I am right and you are wrong. Could it have anything to do with God's intended order for leadership in the family and in the Body of Christ? Is there any possibility of there being an element of divine Providence involved? RRR, have you ever wondered why God might prefer men fill these leadership positions? And have you ever wondered why men might prefer these leadership positions be better fulfilled by males rather than females? - Why did God choose to create men physically stronger (Typically, not always) than women? that causes all of this aggressiveness, territorial-ism? - Why did God engineer females to conceive and give birth? I don't know why God did that. I guess He just wanted to. I'm glad that He did and even if I was a woman, I believe I would be glad that He did it that way. - Why did God make male lions with those big manes? - Why did God make male birds more colorful? - Why only one male goose living with 2 female geese all their lives? - Why only one buck deer and a herd of does? run off with another female? - Why is it almost always the female who fights to the death for the children? Although, all that seems to contradict God's making one queen fire ant to rule millions of males! One queen bee? - Do you think physical strength is better than a weaker one? Do you acknowledge that some women may be stronger physically than some men? And how does that entitle the stronger ones to higher positions? - Is aggressiveness and/or territorial-ism a trait to be desired? - Why don't all women desire children? And is conceiving and birthing children more admirable than those who choose celibacy? - If you think women are more emotional than men, you must not be a sports fan. They jump all over each other, hug each other, group hug, pat one another on the backside, and sometimes a near-kiss is expressed in a victorious win! So given the questions and lack of specific answers, can we assume that were there specific reasons, we should be able to find them somewhere in scripture? Or are we perhaps guilty of making sweeping assumptions from very small premises? RRR, I have a hard time relating to the animal kingdom though I do love investigating their habits. Imagine my surprise when I discovered it is the female seahorse who impregnates the male and the male who gives birth!! I think I remember that correctly. At any rate, I find it a distortion of the gospel to slice and dice it into male and female. I have found that many (if not most) gender-specific commands are not exclusive and do not preclude applying to the other. For example, just because Paul admonishes/commands fathers to not provoke their children, does that mean it's ok for mothers to provoke the children? Of course not. And just because Paul directs his commands about modesty to women, does that mean men can dress however they want? Of course not. And just because Paul tells husbands to love their wives, can we assume women do not have to love their husbands? Of course not. You might read scripture differently if you recognize the principle of "good news" for all rather than from a male/female gender rulebook. I haven't read the book, "Your God is too Small" by J.B. Phillips, but I'v heard sermons about how Phillips astutely pinpoints some of the erroneous ways we often see and understand God. And through that lens we incorrectly translate His word. It appears having male body parts imparts great wisdom, strength, clarity, leadership (whatever that means) ... I have always suspected that men mostly think via their male organs (sarcasm alert). But we have evidence via Daniel and his three buddies acquired great wisdom AFTER they were castrated. Hence it follows all men in ministry if their male organs are removed can aspire to become super duper senior pastors. Yes I know in new testament Jesus and his apostles kept their male organs. This gives rise to many questions. One, which I heard some time ago, is "If God gives a woman a message, what's she supposed to do with it?". Another is "What if the Holy Spirit sovereignly gifts a woman with the gift of, say, leadership, or preaching?" Is she to assume that her gender limits how she is to share it? And is it possible that every promise in the Bible is not made to everyone, everywhere, for all time? Or perhaps the same with reference to instructions? Is it possible that some scripture overrides other scripture? Like Jesus statements to the effect that, in Him, there is no male or female? Which might override Paul's statements to Timothy .. where Timothy was and when Timothy was there ... about women and silence and who they can teach? And come to think of it, that does not seem to be an instruction to Timothy .. Paul could give really clear instructions when he wanted to ... but rather it was an observation on what Paul did and did not allow, where he was and when he was there. It's been said that, eventually, the objective of any organization morphs from the reason it was formed, to self-perpetuation. I think that's true with how we do lots of things, as well. There is a theme that remains constant in the human spirit. I think it is a part of OUR humanity, rather than any expression of our gender . . . some things go deeper into 'who we are' as human persons made in the image of the Creator God. The theme of the dread of being 'buried alive', kept enclosed and silenced, while our gifts go unused . . . this is a theme that is shared by all human persons regardless of their gender. (Eowyn) " . . . I do not fear either pain or death"
" What do you fear, Lady?" (Aragorn)asks.
" A cage", she said. "To stay behind bars, until use and old age accept them . . . "
There's another thing that remains constant in the human spirit, Christiane. Which is part of our humanity. Thank you, Wade, for the post. For more on the Countess and the women preachers of the early church, please visit the website for the book series, The Asbury Triptych Series. There is a lengthy article on Lady Selina, The Countess of Huntingdon and a lengthier article on the women preachers of early Methodism. The website for the book series is www.francisasburytriptych.com. Thank you again for the article. run off with another female?" Why does the female black widow spider eat her mate? Victorious: " - If you think women are more emotional than men, you must not be a sports fan. They jump all over each other, hug each other, group hug, pat one another on the backside, and sometimes a near-kiss is expressed in a victorious win!" Uhmmm, yeah. My daughter is a Bengals fan. I am a life-long Steelers fan. You should have seen the two of us last weekend! On a more serious note: Isn't it a bit twisted that most SBC churches pride themselves on "keeping women in their place", yet they really push for donations to the Lottie Moon offerings??? I'm about burned out with church -- tired of living in the Tolkien cage. Or are we perhaps guilty of making sweeping assumptions from very small premises? I couldn't agree more with this statement from Victorious. When I read that women led and taught throughout scriptures, I see no one called out except Jezebel in Revelations, and she is called out not because she IS teaching but fow WHAT she is teaching.